Touting itself as 131 stores on 41,000 square meters, the Golden Hall or Γκολντεν Χωλ in Maroussi welcomes anyone with a “Passion for Fashion” and disposable income from November 2008. This is the third mall in Athens, following the well-heeled Attica Department Store in Syntagma and the Mall of Athens, also in Maroussi. If you’re in Piraeus, there’s a smaller shopping center called Athens Heart; and the Athens Metro Mall opened on top of Ag. Dimitrios metro station in southern Athens. How to get to Golden Hall in Athens by car, public transportation or shuttle bus in English, see “Accessibility” and use the left menu to make your selection. Cost: Maximum charge of €3 for the entire day, Monday–Sunday. The underground car park has 1,400 parking spaces, plus access and special places for disabled persons. * If you plan to be in a restaurant until 1:00 or 2:00, you must enter the parking lot before midnight. Restaurants and cafes are open on Sunday in summer (not winter), even when the rest of the mall is closed. During the Christmas season, usually starting in December, Golden Hall holds special events and there is a small ice rink where people can rent skates and enjoy sessions for a fee. The Mall of Athens, Attica Department Store and Golden Hall are owned by the same company/people, so it’s a monopoly. It means the rich are getting richer no matter where you shop in Athens, and the consumer does not benefit because prices will be the same at all three locations. the golden hall is housed in the building previously used as the international broadcast center for the olympics… the place where all television and radio signals gathered from all over and subsequentally sent to the globe. i don’t think i was alone in hoping that the infrastructure built for the olympics would somehow be utilized to actually benefit people with, perhaps, art or culture, instead of becoming another altar to profit. TMT – Truly, I agree with you. I’m not opposed to the buildings and stadiums going to some use instead of nothing. However, they were originally supposed to be vehicles to enrich the local neighborhood, attract international events and serve the residents of Athens as a common good, not bring more traffic, pollution and, as you said, profiteering for few. Sad. wasn’t aware that Latsis owned Attica too. Attica department store barely made 1.5 million profit after its first year of trading; hardly a goldmine. B – Latsis (Lambda) doesn’t own Attica, however minor shareholders in Attica also hold shares in Golden Hall and Mall of Athens. Nooooooooooooo. Stop the mall invasion in Greece. Keep your local stores, your Mom-and-Pops. Keep people walking on the streets and greeting each other like humans, keep your town centers and shopping districts. GC – One of the things I like about GR is the mom-and-pop stores, but I don’t mind a mall if it provides many good stores in one place because people without cars or in wheelchairs (has elevators) might find it convenient to shop all in one place. The problem, in my humble opinion, is the selection of stores is not very good, the selection once inside the store is limited because of space, and prices aren’t competitive. Three malls in one city and two in the same suburb is excessive. T – The Attica owners are: Elmec Sport (25 percent), Epirotiki (25 percent), Constantine Lambropoulos (10 percent), Alexis Sgoumbopoulos (10 percent), Ritchie Francis (10 percent), Constantine Tsouvelekakis (10 percent), Vassiliki Foka (5 percent), and Asterios Economidis (5 percent). Some Attica owners have a share of the Mall of Athens and Golden Hall, which is the reason Attica has a presence inside GH and aren’t considered competitors. Who owns what percentage? I don’t have that information at the moment. P.S. I forgot to add that the gateway “flag” you got might have occurred precisely at the time some plug-ins were being updated. This is a great development. One of the major effects of a huge shopping mall is to generate huge amounts of auto traffic, something Athens certainly needs more of. I came back to your post as I was interested in your feedback. Good points! Our Papou has often said that it is impossible for the disabled to navigate the streets in many respects, and I can see the issues. I’m just rather a mall hater myself as to me it typifies the quest for consumption. 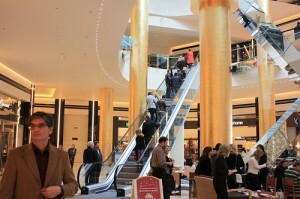 GC – Aside from disabled access, there’s nothing good about it. So I agree with you, being a mall hater myself. Just one of many things I hate about living in the USA. Don’t forget that “The Mall” is the largest illegally erected building in Europe. BB – Another good point. An excellent topic for another post. Another advantage is that Greek teenagers in the area will now have a genuine American-style mall to hang out at. Like, what’s, like, Greek for, like, “like”? As an American living on Paros I found my first visit to The Mall quite interesting. i was eastbound trying to get home on saturday and i tried getting off of the attica road at the kifissias ring. it had a traffic jam that looked like it was going to last for hours — so i gave up and went to the next exit. any connection to the golden hall? you think? S – I agree with you on both counts. Wagamama is a good thing, and closing on Sunday when people have leisure time to shop is a bad idea. Although they now open the mall on Sunday to allow people to “window shop” and accommodate passage to restaurants. Thanks for stopping in. I love this site! Okay on to the post – I am absolutely not thrilled about the mallization of Europe generally speaking – they’re everywhere and I personally find it excruciating to walk through some amazing cities only to be confronted with a behemoth mall that is supposed to induce me to spend money – I end up talking to locals to find the boutiques and have a much better time. Perhaps the only saving grace of something like this is that it does in fact raise employment – although – I expect that you know have a better grasp of the numbers to know if it in facts helps raise the bar or not. Having spent some time in Greece however, I don’t expect the mall to ever the replace the cafenio – at least in summer – where you can sit for hours without spending more than a cup of coffee, smoke to your hearts content and watch all the action. P – It raises employment marginally, but it doesn’t really contribute to quality of life for most since the only people who can afford to go to these malls are usually the elite. I agree that the kafeneio and small shops will never go away, but it’s getting harder with the continued violence and the economy, which will see conglomerates merging to survive. i don’t know if the kafeneio will be replaced completely, but the mall, the next to newest one, is full to capacity on the weekends, with other customers searching in vain for a seat among the lucky hordes that have already found one. the high cost of everything and the ridiculous cost of paid parking doesn’t seem to be a deterrent. this is aided by the fact that it’s right next to the neratziotissa metro station and people from all over athens can visit. i saw buses labeled ‘golden hall’ at the station, perhaps serving as a shuttle for the public to the less -conveniently located golden hall. you can’t know if the malls are raising employment or, with the decrease in smaller businesses all around, actually reducing it on the whole. perhaps someone has numbers on that. small businesses are giving way to large in greece, as they are the world over. I belonged to a group of people, who built the main power supply rooms at Golden Hall. Let me inform you that almost the whole building was transformed by foreign people (Pakistans,Albanians,Romans,Polish etc.) VERY few Greeks, and only by one of the construction companies responsible. The building had no maintenance since the Olympic Games, and was — and still is– filled with dust all around, even more with garbage on the rooftops. So what shines in front of your eyes doesn`t mean it`s “Gold”…..and much more to say, but that`s enough. Thanks. That`s all…..